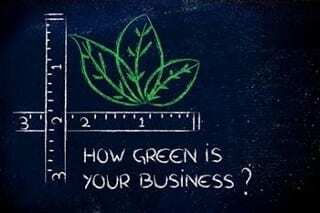 “Going green” should be a key objective for any company. A few of the rewards for embracing sustainability include a positive public image, cost savings and potential competitive advantage. Less tangible, but certainly real, is the heightened morale and sense of accomplishment that employees enjoy while participating in green projects. A culture of sustainability is important to the success of any initiative. While green projects might be company-wide initiatives, facilities managers and maintenance supervisors are responsible for implementation. These individuals are usually responsible for resource and energy management, recycling, composting, maintenance products procurement and other related functions. Low-energy lighting can reduce the energy needed for lighting the facility. CFL and LED lights last longer and use approximately 40% of the electricity used by standard incandescent lighting. In large buildings or campuses, the savings can be very significant. Sensors, timers and dimmers can be added in lower traffic areas and in buildings that are not in operation for 24/7. Timers may shut off external and internal lights at specific times of the day or weekend. Sensors shut off lights when there is no movement and turn them back on when motion is detected. Door and window seals must be periodically checked to ensure energy is not escaping unnecessarily. Also door closures should be maintained in top condition. HVAC filters should be replaced and regular maintenance performed on HVAC systems. Clogged filters and under-maintained motors are inefficient and work harder than necessary to achieve the set temperature level. Timers and sensors for landscape watering should be installed. Lawns and planting areas should only be watered as needed. Setting specific times and amounts can be extremely inefficient and wasteful, delivering more water than is necessary or even healthful for grass and plants. Sensors that can measure the current soil moisture levels and detect rain will modify schedules to deliver the proper amount of moisture. Replace existing grass and plants with drought-resistant varieties. Certain products can reduce required landscape watering by 50%. Composting solid waste to be used as a natural fertilizer is an excellent way to save money and reduce the amount of material that is sent to the landfill. Regular composting can reduce or eliminate the need for commercial fertilizers. Recycling receptacles can be placed throughout the facility or campus. Again, developing a real culture of sustainability will enhance support for recycling. The receptacles should be conspicuously placed with signage that sends a clear message to employees about the benefits of recycling. Equally important, the use of recycled materials for paper products and packaging is a complement to a successful recycling project. Use low-VOC paints for parking lots and pathway striping instead of petroleum-based products. Universities and other institutions have implemented BioStripe® soy-based paints that are ecologically positive and do not emit toxic gases which are harmful to the atmosphere. Replace harmful cleaning supplies with environmentally safe products. For every cleaning application, forward-thinking manufacturers have developed alternative products made with safer ingredients. There are capital intensive projects that support sustainability by saving energy, water and increase the use of recycled materials. These may include low-energy systems, water reduction appliances and water recovery systems. But addressing simple, inexpensive projects is a great starting point that can be instituted in a short time. How does your company go green? Share your sustainability initiative ideas in the comments below!